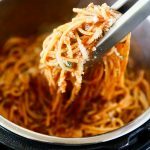 Easy one-pot Instant Pot Spaghetti that tastes like it has been cooking all day. In a 6 Quart Instant Pot, heat olive oil using Sauté function set to high (More setting.) Sauté onions for 2-3 minutes or until they start to soften, then add garlic and sauté for another minute. Add ground beef and season with one teaspoon of kosher salt and several turns of freshly ground pepper. Continue cooking ground beef breaking up as it cooks until cooked through. Add low-sodium chicken broth to Instant Pot and use it to deglaze instant pot by scraping the bottom of the Instant Pot. Stir in marinara, tomato sauce, soy sauce and uncooked spaghetti noodles. Lock lid in place and set Instant Pot to 5 minutes on High Pressure. Make sure pressure release valve is set to sealing. Instant Pot will take 10-15 minutes to come to pressure, then will start 5 minute cooking time and countdown from there. Once Instant Pot has counted down from 5 minutes it has completed cooking. Turn pressure release valve to venting and let Instant Pot Quick Pressure Release. Stir in fresh herbs and sprinkle with parmesan. Serve immediately.